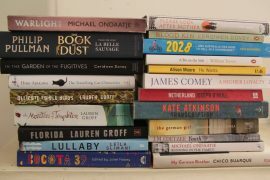 There’s rich literary pickings in Queensland, Australia, as the shortlist for the Queensland Literary Awards reveals. It used to be the Queensland Premier’s Award until the Government pulled its support but all credit to the businesses and academic organisations that stepped in to provide the funds for the Awards to continue. There are 42 books, whittled down from more than 200 entries, in the running for awards in more than 10 categories. The spectrum covered is vast. The Man Who Invented Vegemite (that oh-so-Australian spread) by James Callister is one of the six battling it out for Book of the Year. Kristina Olsson’s Boy, Lost tells the heart-wrenching story of the life-long impact on a young woman and her family after her son is stolen from her by an abusive partner. Or there’s Jane Lydon’s The Flash of Recognition which looks at the role of photography as a tool for change and reconciliation between Indigenous and non-Indigenous Australians. Or Murray Bail’s The Voyage about Sydney piano manufacturer who travels to Vienna to present his unique concert grand piano. And as Narelle Oliver wisely warns, Don’t Let a Spoonbill in the Kitchen. The full roll call of short-listed books and authors is below and you can find out what the judges thought at http://www.queenslandliteraryawards.com/2013-shortlists.html. You can also vote on-line for the Queensland Book of the Year and People’s Favourite. Book of the Year: The Man Who Invented Vegemite by James Callister, Three Crooked Kings by Matthew Condon, My Hundred Lovers by Susan Johnson, Mullumbimby by Melissa Lucashenko, The Secret Keeper, Kate Morton and Boy, Lost by Kristina Olsson. Fiction: The Voyage by Murray Bail telling the story , Lost Voices by Christopher Koch, Mullumbimby by Melissa Lucashenko and My Hundred Lovers by Susan Johnson. Non Fiction: Sandakan by Paul Ham, Boy, Lost by Kristina Olsson, Gough Whitlam, His Time by Jenny Hocking, Madness, a Memoir by Kate Richards and Give Me Excess Of It by Richard Gill. History: Antarctica by David Day, Children of the Occupation by Walter Hamilton, The Flash of Recognition by Jane Lyndon, The Ambitions of Jane Franklin by Alison Alexander and Our Stories by Lawrence Bamblett. Poetry Collection: Eldershaw by Stephen Edgar, Haunted Rooms by Paul Hetherington, Jam Tree Gully by John Kinsella, Subtle Persuasive Protest by Gig Ryan and Prepare the Cabin for Landing by Alan Wearne. Short Story Collection: Like a House on Fire by Cate Kennedy, An Unknown Sky by Susan Midalia, The Rest is Weight by Jennifer Mills, Las Vegas for Vegans by A.S. Patric and We Are Not The Same Any More by Chris Somerville. Film Script: An Accidental Soldier by Blake Ayshford, A Most Wanted Man by Andrew Bovell, My Mistress by Gerard Lee and Stephen Lance, Healing by Craig Monahan and Alison Nisselle and Around the Block by Sarah Spillane. Emerging Author: Gap by Rebecca Jessen, Corkscrew Section by Jarryd Luke and The Promise Seed by Cass Moriaty. Unpublished Indigenous: Sugar Shed Road by Martin Doyle, Hard and Heat and Light by Ellen Van Neerven, Could Be Worse by Adrian Stanley and My Journey Never Ends by Dorothy Williams-Kemp. Young Adults: Voyage of the Unquiet Ice by Andrew McGahan, A Corner of White by Jaclyn Moriaty, The Convent by Maureen McCarthy, Friday Brown by Vicki Wakefield, Wildlife by Fiona Wood. Children: Pennies for Hitler by Jackie French, Today We Have No Plans by Jane Goodwin, Pookie Aleera is Not My Friend by Steven Herrick and Don’t Let the Spoonbill in the Kitchen by Narelle Oliver.